It is very likely that you have heard of collagen and the fact that it has anti-aging benefits. You may also have heard of collagen supplements. These have become popular products on the market today. In this article, we will explain the importance of collagen, the role that collagen powder can play in your body, and 3 anti-aging benefits of collagen. Collagen composes about a third of your body’s protein which makes it a highly important part of our health and well-being. What is comprised of collagen? Your bones, skin, muscles, tendons and ligaments all contain collagen. Other body parts including blood vessels, corneas, teeth also contain collagen. Did you know that your gut health can also be supported by consuming collagen? A healthy gut means that the body can absorb more nutrients. Collagen is often thought of as “glue” in the body. The Greek word “kólla” is where the word collagen came from and means glue. It is possible for your body to produce collagen, if it has the right nutrients available to do so. To make more collagen, Vitamin C, proline, glycine, and copper are all needed. A key piece of this puzzle is that you also need protein that is not only high in quality but also contains the amino acids that are necessary for the body to make new proteins. how does collagen work in your body? Type I is made of densely packed fibers that constitutes a major part of the skin, bones, tendons, fibrous cartilage, connective tissue and teeth. It is made up of densely packed fibers and accounts for 90% of your body’s collagen. Type II is found in elastic cartilage which is responsible for cushioning the joints. It is made of more loosely packed fibers. Type III supports the structure of muscles, organs and arteries. Type IV helps with filtration and is found in layers of your skin. In addition to this list, collagen is known to aid in digestion, give you an energy boost. It is known for promoting healthy DNA, joints, hair and nails. Many people also think of it as anti-aging as it helps with elasticity in the skin and reduces wrinkles. We will discuss 3 anti-aging benefits of collagen next. Muscle mass: A 2015 study in elderly men showed that a combination of collagen peptide supplements and strength training increased muscle mass and strength more than a placebo. Arthritis: Another study gave supplements to people suffering from osteoarthritis. They experienced a significant decline in pain over the 70-day study, compared to those who took a placebo. Skin elasticity: Women who took a supplement showed improvements in skin elasticity in a 2014 study. Collagen is also used in topical treatments to improve the appearance of skin by minimizing lines and wrinkles. how can you supplement collagen? One way to supplement collagen is to consume collagen powder which consists of collagen peptides. These peptides provide additional health benefits over other forms of collagen because of the increased absorption into your bloodstream. Collagen peptides do not gel and there are many unflavored options on the market. Because of this, the powder does not change the texture or taste of your food. It is easy to use collagen powder in smoothies, shakes, soups or baked goods without changing texture, flavor or adding extra carbohydrates. By combining 100% hydrolyzed marine collagen, avocado powder, pure C8/C10 medium-chain triglyceride (MCT) oil powder and grass fed butter powder, this is the first collagen protein of its kind. Top Notch Nutrition worked to amplify the benefits of collagen protein. The healthy fats are incorporated into this product so that your body can use that for energy. 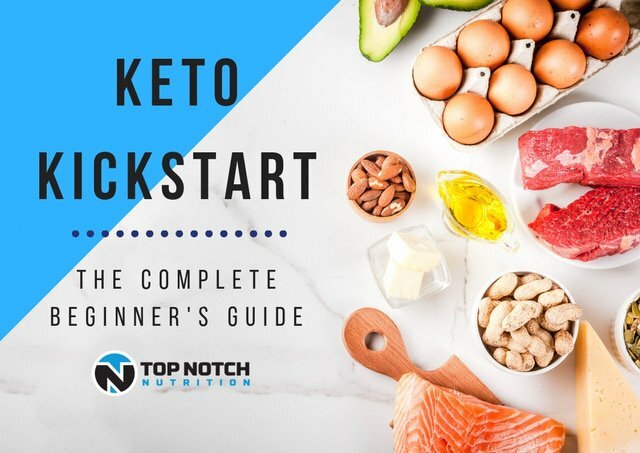 If you are partaking in a keto diet, it is important that you do not get kicked out of ketosis, a metabolic process of burning fat. Too much protein can cause that to happen. 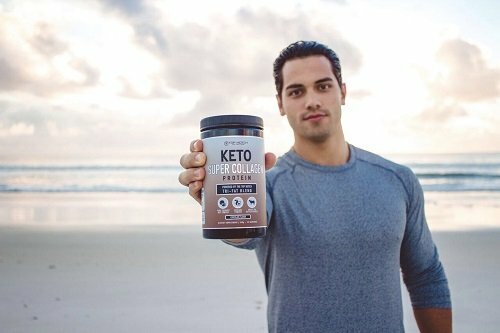 The balance of protein (collagen) and healthy fats (MCT oil powder, grass fed butter powder and avocado powder) gives you a good balance to keep your body in ketosis. This super collagen protein powder includes a unique blend. The Top Notch Tri-Fat Blend which is made of 7,000 milligrams of high powdered fats including C8/C10 MCT oil powder (for ketone production), avocado powder & grass fed butter powder. 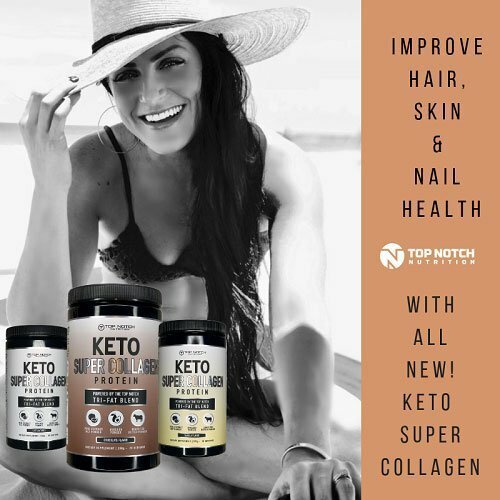 You will not find any artificial ingredients in the Keto Super Collagen Protein or any of their products. There are no artificial sweeteners, coloring, chemicals or binding agents. The serving size is one scoop which contains 91 calories, no sugar, 6 grams of fat, 1 gram net carbs and 10 grams of protein! If you have any concerns with your health, as with any dietary change, it is important to discuss collagen supplements with your doctor. Recall that 3 anti-aging benefits of collagen are: increased muscle mass, less pain related to arthritis and improved skin elasticity. When looking for a collagen supplement to aid in these areas, remember the importance of reading nutrition and ingredient labels. Your overall health relies on your nutrition, so we want you to have the information needed so you can make informed decisions regarding your diet.